When you took over the Wall Street Journal not long ago, you made a promise you will not influence the editorial integrity of the paper. We understand that you have to sell newspapers. Sensationalism works in the media and it has worked for you numerous times in the past. But does it justify turning the Wall Street Journal into a tabloid? The photo you chose to plaster on the front page doesn't belong there. People certainly must know what is happening in Iran. We discussed that issue in detail, including that gruesome video. The goal was to expose the brutality of the regime and the struggles of Iran's people. 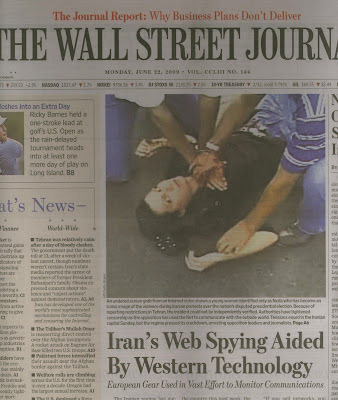 But Neda and her family deserve better than to be used to sell copies of the Wall Street Journal. This is not significantly different than a certain New York City tabloid who chose to print a photo of Eric Clapton's dead child (after a tragic accident) on the front page some years back. This is just in bad taste.